This nicely hand made spoon in the popular Art Nouveau style features an uncirculated French bronze one centime coin dated 1891 in a bezel mounting with a fleur de lys crown finial. The bowl is engraved with the word "Paris"
The back of the bowl is engraved "April 25, 1905"
I do not know why there is such a large time gap between the coin and the bowl engraving. 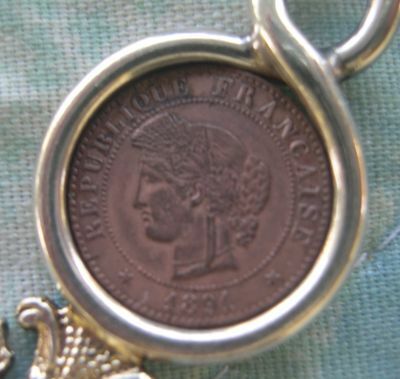 A one centime piece was similar to a penny in value during the 3rd Republic. I suspect that the spoon was made to be a 'lucky penny'.